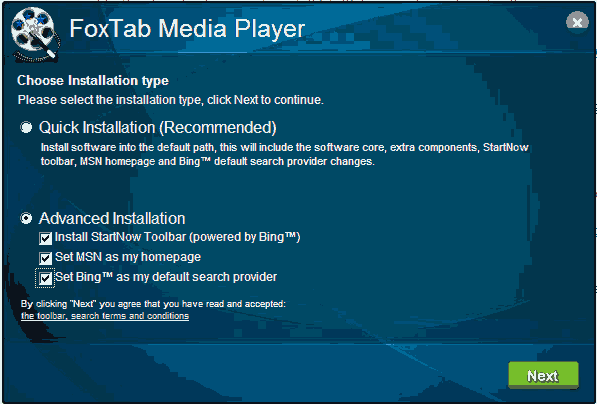 What is the FoxTab Media Player? Is it safe? | America loves Sporks! What is the FoxTab Media Player? Is it safe? During this holdiday week, I spend a lot of time looking for new streaming radio stations, and fixing up old broken links. It purports to play Flash media files without using Adobe Flash. Is it trustworthy? Does it do bad things? Is there any reason to install it? Being willing to take a risk, and protected by Sandboxie :), I thought I should check it out so you don’t have to. FoxTab seems to be a company mainly involved in addins for the Firefox browser, but the player isn’t related to Firefox. When you download the player and begin the install process, it identifies the author as folks called “Install Core” http://installcore.com/. Install Core is located in Israel, the country that brought you Stuxnet. That sounds a little ominous, like this download is going to install “stuff” deep inside the core of windows to allow tracking and throwing up advertisements in places other than the Media Player, or maybe I have uranium centrifuges running in my basement. Don’t know – let’s play along. A toolbar from Bing! (aka Microsoft) – you can never have too many toolbars snooping on everything you do! Set MSN as my homepage! Make Bing! (tm) My default search provider. Having declined that generous “offer”, I’m then given the “offer” to use ask.com and add its toolbar with its mandatory “Auto Update” function that could pretty much do anything it wants at any time. Um, No thanks. When I say “No”, it suggest that I can always remove it later – am I really sure I don’t want this generous free option to save me money? Yes, I’m sure. Next I get an offer to “Support the ASPCA” every time I shop online. No thanks, I kill puppies to make chili. This “free” player is getting more and more expensive. Now I am offered (Default is “I accept”) the FREE Sendori “Free” thing to “Protect” me from phishing by taking control of my DNS. Ummm absolutely not. Now the installer is “optimizing” my packages, and offering me a chance to download and install a PC Tweaker and a “Free” PC Backup program. I’ll take a pass on that. So after all of that bait, what is the gold at the end of the rainbow? Hmmm…. it’s “FLV Player” (FLV = Flash Video). It wants to know the name of the FLV file I want to play. That’s it. I don’t have any, sorry. So why did I want this again? This has nothing to do with streaming for this radio station. Why exactly is the radio station luring me into installing all kinds of tracking spying crapware onto my computer for no reason? This entry was posted in About the Guide, Mobile Streaming, Radio Biz. Bookmark the permalink. 2 Responses to What is the FoxTab Media Player? Is it safe? Thanks Art, for taking one for the team. I hate that junk that wants to install and bury crap on your computer. I like to keep things simple. I get annoyed with flash, so its a non click on this crap.